What a fun Market it has been! Busy, no doubt! I have not gotten around to se everything, but stumbling across people in the aisles or at the Msrcus or Suzzix booth certainly is worth it! 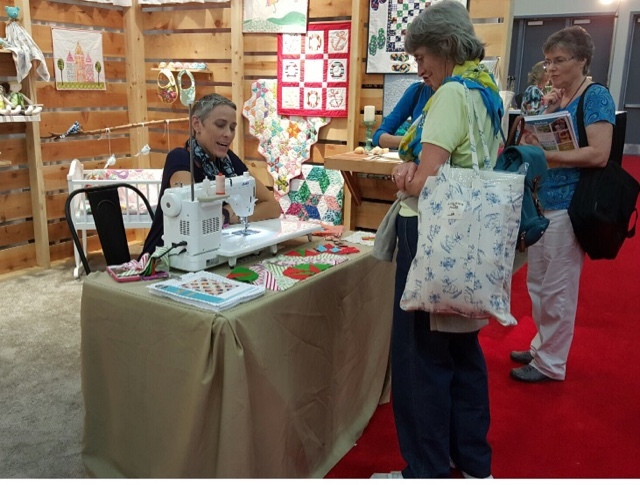 My friend Shelly of Prairie Moon Quilts, who has this years BOM quilt for Kansas City Star, her book, will be coming soon! 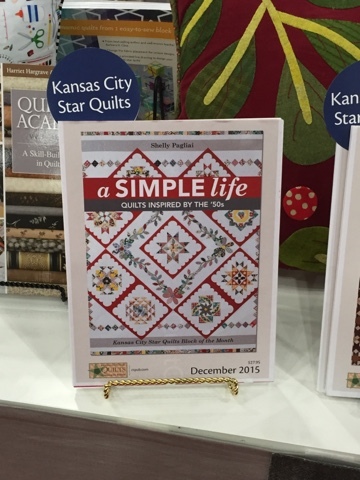 C&T publishing bought Kansas City Star Quilt publishing recently. Having my exhibit of 17 Double Wedding Rings up has been a pinch me moment. Above is my "Color Play" quilt, that will travel to the Texas Quilt Museum next. I will try to do a little video or maybe even my first periscope, if I can figure that out! 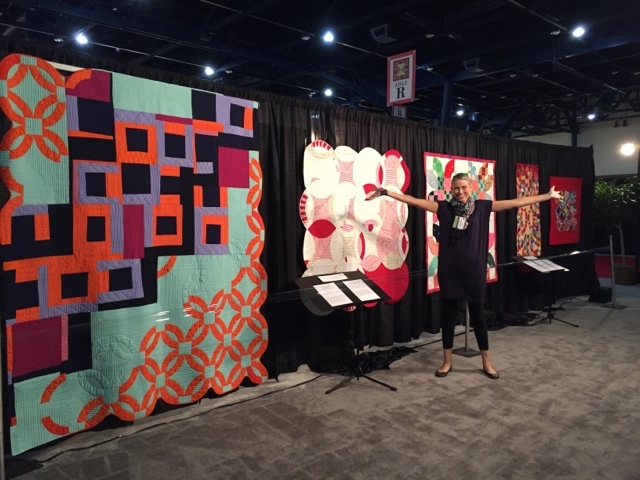 I attended the lecture of the Magna Carta quilts, here Paula Doyle talks about the story, and the quilts, which are quite wonderful! 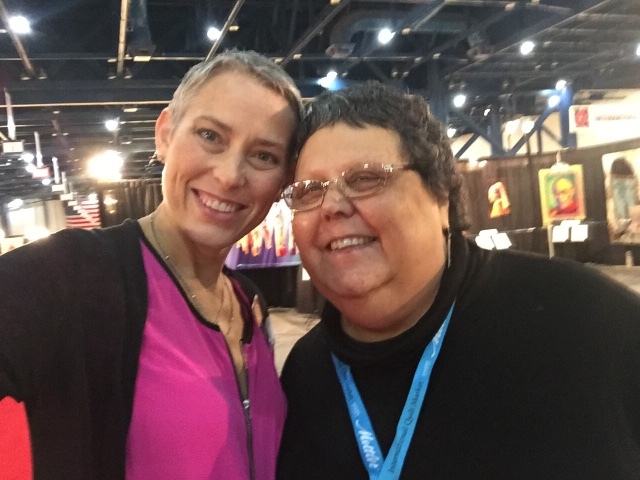 Paula Doyle and I. Check out her books on miniatures. Pretty neat stuff! A fat quarter bundle of my fabrics, Mostly Manor. Yes, another little squeal. They are so stinking cute! Right? 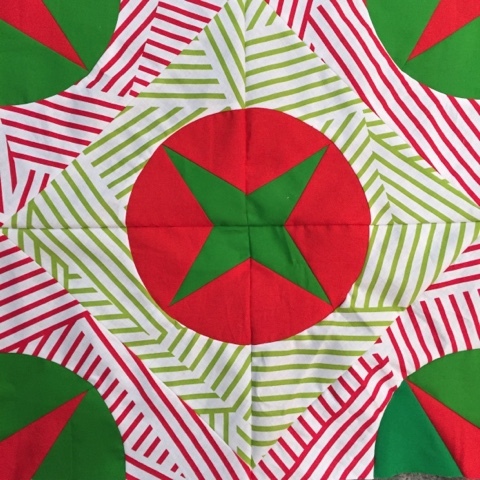 This is a block I whipped up using my new Sizzix bow tie block using my Mostly Manor, Manor stripe in red and green! Perfect for Xmas!! Kind of like jingle bells! 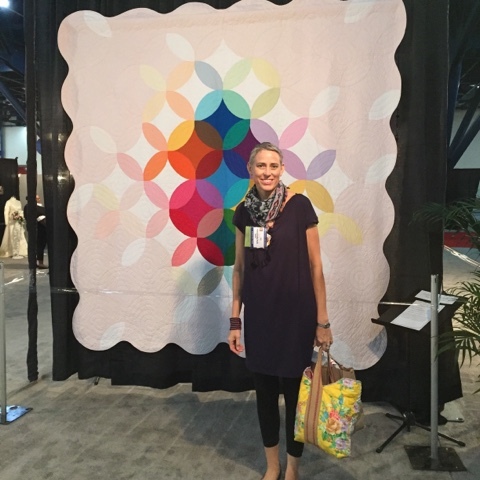 Kaffe probably did a little squeal too, Victoria Findlay Wolfe quilting rock star. 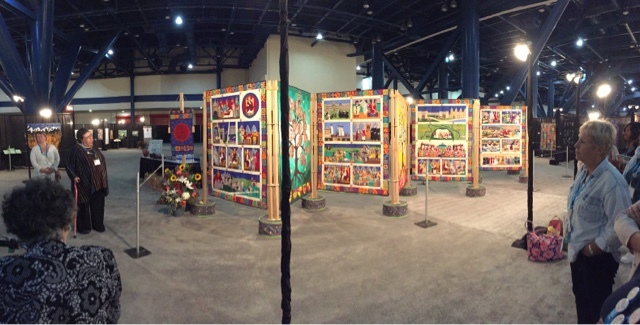 I am amazed of how many quilts you produce. your like a dwr factory. 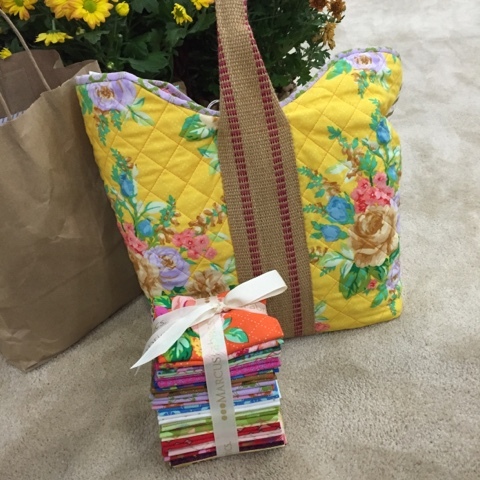 I love your Color Play quilt! Thank you for sharing all the lovely photos! THANK YOU ALL for the quilt love.. It means a lot to me, and I appreciate your kind words. Wow, you're already having a very great year and there's still more days left. 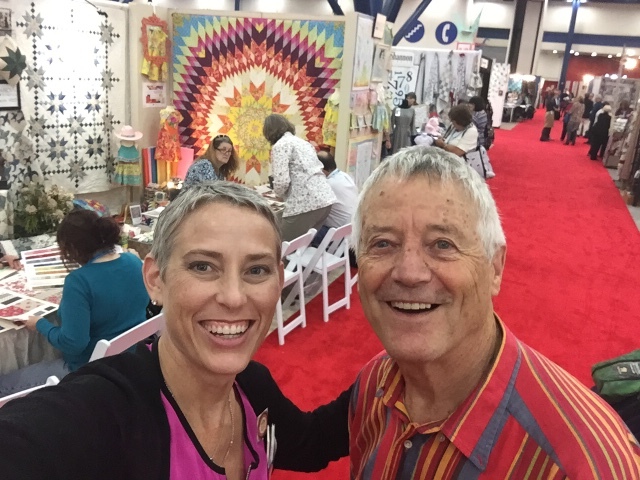 But the icing on the cake already besides all the wonderful quilts you've made and the places you've been, a selfie with the man, Kaffe. How lucky can one girl be. I'm going to check out your new bowtie die and of course your fabric. You're a good influence, I've purchased this past year, so far, the Sizzix Big Shot Pro and a Juki 2010Q which I love dearly so the trifeca would be your fat quarter bundle. haha! Sorry about that! Happy to share products I love. I'm a creature of habit, and I don't waver far from the things that work for me...If I wasn't happy with a product I'd move on... so, I Love my Sizzix and LOVE my Juki's. Your variations on a theme are fabulous. Thanks for sharing your great photos. Yes those fabrics are really stinking cute!! I can't wait to get my hands on some. Your quilts are all gorgeous but Family Album is so very special. Wish I could have seen it in person. I can't wait for them to be available to you all... I'm so pleased with them!